Aloe Vera is known for its soothing, cooling and healing effects on the skin. It is often found in dry climate areas such as Africa and Asia. 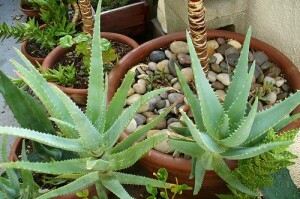 Since ancient times, aloe vera has been used for its medical properties. Many people believe that it is a miracle plant that can remedy almost any ailments. In fact, the ancient Egyptians refer to it as the “plant of immortality”. There are many health benefits of aloe vera. However, this article will focus only on its benefits to the skin. Here are 10 uses of aloe vera for the skin. Aloe vera is well-known for its moisturizing effect to the skin. Most lotions for dry skin contain aloe vera gel which hydrates and locks moisture in the skin. It penetrates deeply into skin and brings all its nutrients deep down. The natural hydrants and moisturizer helps restore the normal pH balance of the skin. A useful plant hormone in aloe vera, known as cytokinin, is beneficial to preventing or slowing down the aging process. It inhibits cell senescence by preventing protein and RNA synthesis. Due to the plant hormone, auxin, aloe vera is a good remedy for sunburn. Auxin has anti-inflammatory properties and aids in tissue regeneration. Applying a freshly cut aloe vera to the sunburned area cools it down, reduces pain, moisturizes it and helps heal damaged skin. Newly appeared stretch marks can still be remedied. Apply fresh aloe vera on the affected area to help repair the microtears in the skin. When applied regularly for longer periods, the skin will eventually heal itself, thus, lessening the visibility of stretch marks. As mentioned before, aloe vera has anti-inflammatory and tissue regeneration properties. Apart from these properties, the plant also contains anti-microbial properties that helps heal acne faster. The plant is effective in lightening hyperpigmented skin caused by acne scarring, age spots, wound scars and burn scars. It is also an effective way to lighten tanned skin. To maximize its lightening effect on the skin, mix it with lemon juice and apply on areas you want to lighten. Aloe vera contains vitamins C and E that can help maintain the skin’s vitality. Coupled with its natural moisturizers and the gel-like consistency, applying it regularly to the face prevents the formation of fine lines and wrinkles. It also preserves the skin’s firmness especially when made into a facial mask. Did you know that aloe vera contains anti-inflammatory properties which helps ease the signs and symptoms of eczema and psoriasis? Aloe vera is also good for insect bites, skin allergies and blisters. It serves as counter irritant too. The plant hormone gibberellin detoxifies and eliminates byproducts / wastes quickly, thereby, producing a healthy glow from deep within. Aloe vera is a good addition to foot and facial scrub because it helps remove dead skin cells efficiently.